Dead Wake by Erik Larson, trade paperback from library, March 2015, 430p. Dead Wake had to have been one of the most hyped non-fiction books in 2015, and I decided that I couldn’t let it sail past without at least giving it a read. I’ve always enjoyed nonfiction about boats, especially submarines, and Dead Wake follows the sinking of the steam passenger ship, Lusitania by the German U-Boat, U-20 during WWI. I’m not familiar with Erik Larson’s previous work, but was impressed by the quality of the writing. Larson is very adept at weaving together the stories of multiple people and following them throughout and after the disaster. I didn’t find his writing exceptional, rather proficient. What is exceptional is Larson’s ability to select a story that can captivate an audience and including a mix of personalities that we know or come to know. Honestly, I found the chapters about the U-20 and Walther Schwieger to be more interesting than the ones aboard the Lusitania or on dry land. The operation of the U-boat, and the way the captain of the ship, Schwieger, had complete command over which ships he was going to attack, where he was going to travel and how he was going to conduct missions was really interesting to me, I didn’t actually know much about WWI U-Boat operations. I found the descriptions of his personality to be especially interesting – he seemed like a ruthless but personable character. I would have liked to know more about the other Germans who were onboard, but we only really got introduced to one other person on the U-Boat. The numerous chapters about President Wilson and Edith Galt were boring, not necessary to the plot and seemed to be thrown in because the author felt he needed a romantic subplot. He didn’t. It wasn’t entertaining, I was more entertained in the half page story of Clementine Churchill’s dinner party. The pace at sea was increasing, the intelligence was heating up, the war was being inched forward in the trenches with thousands dead, the politics were becoming more convoluted between the numerous countries – but now we must stop to see the President and Galt go for a drive in his car and a round of golf in the morning. It would break the rising tension and frustrate me every time, it was badly constructed and I can’t imagine anyone REALLY caring about this relationship. There is one thing missing from this edition of Dead Wake that was surprising to me – a lack of pictures and maps. Normally in a nonfiction like this you get treated to at least one package of photos – usually glossy pages in the middle of the book. I would have expected a number of pictures of the Lusitania, some of U-Boats, maybe even a destroyer, pictures of what some of the other sunk boats looked like, a map of where major events occurred, pictures of the people included in the novel. I know that there are pictures of all these things because Larson mentions people taking the photos and he includes them in his notes. In Dead Wake there was a single picture of the Lusitania at dock. There were no pictures of what a U-Boat looks like, or a map of the path the ships took. It was something that I personally missed, because my factual brain liked to know what things actually look like, not what my imagination assumes. The action of the story was addictive, and I enjoyed the chapters dedicated to the actual sinking of the ship and the aftermath. I won’t say much more about it, but the gradual conspiracy that emerges through the book is terrifying and made me look at a certain Englishman in a different light. To conclude, Dead Wake was enjoyable but I don’t think it quite lived up to its hype. I would recommend it to readers of naval history, world war one history or those who enjoy the occasional non-fiction romp. It’s the end of another year! I can’t believe how quickly this year has passed. There have been some great moments and some not so great moments, but I am ready for 2016! I’ve read some great books in 2015, and I have compiled a list of the 15 best books, according to me. I’m surprised by how many new releases have made my list, most years I usually work my way through author’s backlists, but now I am actually caught up with quite a few of my favourite series. Anyway, onto the list! I’ve linked to my reviews, if I happened to review them! 15. Flowers for Algernon by Daniel Keyes. I really enjoyed this novel, I read it so that I could teach the short story at school, but found myself wishing I could just teach the novel. It brings to mind so many questions about morals and disability. Such a great book! So tense and well plotted out. My first foray into Cavanaugh’s work, but I’m going to go hustle up some copies of his backlist. I chose to include the first book in this series in my list, despite liking book 3 just as much. I discovered this series in 2015, and I am loving it. Lock is such a great character and I love his tough-cool sidekick, Ty. Yet another series I started this year, this series follows Gil Shannon who is a sniper. I love the way Ewen and Koloniar mixes political, military, action and family drama to create really involved storylines. One of the better classics I have read, this one had a really great twist at the end and kept me reading through a readathon! Leather’s Spider Shepherd series is my favourite series – and Black Ops was a solid addition to it. I get so excited to read these books when they are released, then power through all 500p in less than a day. This was a fun read, but doesn’t feature higher up the list because other books have been more memorable. The first in the Charlie Berlin series – Diggers Rest Hotel is a historical mystery set in the 60’s and 70’s Melbourne. It is really interesting and the characters that McGeachin has created are second to none. This whole series is worth checking out. Sandakan took me AGES to read – about 3 months. It was too heavy to read for prolonged periods, but I felt so compelled to know more that I kept picking it back up, reading for ten pages, and then putting it down in disgust. Not at the author, but at what happened. This is one of those non-fiction reads that made me angry (also, how could I have not been told about this in my many years studying history at university) and will stick with me for a long time. I’ve read all four books in the Death Force series, and they rate up there – each one earning at least four star ratings. My average on Goodreads is 3.2, so that tells you something about how many 4’s and 5’s I award! The big difference about these military thrillers is that it surrounds a team or mercenaries who are completing dangerous jobs not for queen and country, but for their bank balance. It adds a different element. I also like the way that these books feature a very strong ensemble of characters, from all over the world. The last book in the series would be my favourite, but I’ll always be thankful to Death Force for hooking me. I had MacBride’s other novel The Misisng and the Dead at number 8 in this list, but I read In The Cold Dark Ground at the very end of December and it deserves its place higher up this list. I’m a total fangirl for McRae – I love him and his boss/friend/annoyance Roberta Steel. This would be one of my favourite books of the series, I won’t give anything away but… so much happens. The ending is UNBELIEVABLE, and it made me cackle like a mad old witch. The Danny Black series is strong. It was made stronger in Hellfire through an amazing plot featuring Caitlin. She would have to be my favourite character of the year – she was strong, capable and realistic. She was not introduced as a love interest, and although she ended up hooking up with someone, it certainly added depth to her character – not his! Hellfire was riveting, fact paced and Chris Ryan at the top of his game. The Joe Hunter series is one that has cemented its place in my bookshelf and heart. The first few books in the series were good, but a bit formulaic. They combine the hunting down a serial killer trope with the action man character. That’s great, but in the past few books the plot has deepened and the characters have become more engaging. I also have an obsession with the banter between Hunter and Rink – it is so witty and hilarious. 2. The Picture of Dorian Gray by Oscar Wilde. Damn, Wilde can write. I know, that’s not news, but I hadn’t known. I wasn’t ready and I was blown away. The storyline is so well known, so how can you be surprised? I need to hunt down more Wilde now, but I haven’t squeezed him into my classics club list, so it will have to be additional to my monthly classics club read! This surprises me. I like Andy McNab books, and I’ve probably read close to a dozen. They are always enjoyable, but somewhat mindless action romps in which the hero does remarkable things to save the world/the girl/the company and then proceeds like it is no big deal. Not so with Fortress. I was emotionally invested in Buckingham’s situation. I identified with his background and where he was coming from. The exploration of politics and moral issues was deep and complex, with a delicate handling of racism and right-wing extremists. I have put off reading the next book in the series because this book was so good, I can’t imagine that anything will top it, and as such, it will be a disappointment. I’ve never felt like that about a book before. I’m taking part in the 2016 Read My Books Challenge hosted by Maren at The Worn Bookmark. The goal of the challenge is to spend 2016 reading our own books. If you have heaps of books that you already own and want to read some – come and join us! It is super low pressure and you set your own goals. Posted in 2016 Read My Books and tagged challenges, NonFiction, reading challenges on December 12, 2015 by becksawalton. 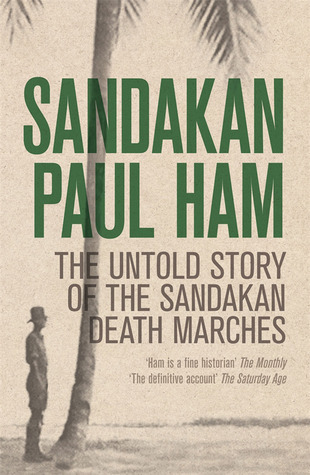 Sandakan: The Untold Story of the Sandakan Death Marches by Paul Ham, 2013, Trade Paperback, 656p. Sandakan by Paul Ham, not an easy book to read, but very enlightening and moving. It is a nonfic work that recounts the Sandakan death marches in Borneo during WWII. Sandakan is deep and thoroughly researched, detailing the little discussed massacre of thousands of POWs. I would recommend this book to anyone who is interested in the Pacific War, Australian Diggers or Death Marches. I had knots in my stomach the whole time I was reading this book, so maybe not a good choice for those with a weak stomach. The biggest shock however were the things that I learnt or were made clearer to me by reading this book. 1. The dropping of the atomic bomb did not end the war in the Pacific. This piece of propaganda is still believed by so many people but does not really hold up to historical research. As Ham states, 66 other cities had been razed by firebombing raids, killing many civilians. The loss of two more cities was merely a drop in the ocean for the Japanese leaders. The naval blockade and other economic factors influenced the surrender more. Japan was happy to present the notion they were ‘saving’ the world from nuclear disaster and America was happy to legitimise using the atomic bomb by claiming it ended the war! 2. Allied bombing of Borneo caused mistreatment of Australian and English POWs on ANZAC day. This little nugget of historical fact is never pulled from the vault on ANZAC day, it certainly doesn’t read very well! I was constantly amazed what these men experienced and still persevered through. Considering the outcome of the Sandakan death marches, the acts of spirit and resistance broke my heart. I won’t spoil this just in case you want to read this book and are hungering for the chapters dedicated to the war crimes trials – I know I was – but things don’t really work out as they should. Depends on your point of view. 5. Heritage and the truth mean so much to the families of those who were murdered. The most shocking thing to me was the extent Australian and British Government went to hide the massive loss of POWs in Borneo. The families of those involved often embarked on long and oft-stonewalled journeys to find out what actually happened to their loved ones. This book broke my heart. While reading the last third of the book I pretty much cried the whole way. It wasn’t what I expected, usually military accounts make for dry reading, but Exit Wounds is a whole different kettle of fish. Major General John Cantwell has written a memoir that is full of action, bravery and emotion. By laying himself bare he has given the soldiers he served with a differing opinion, one that says that mental illness isn’t something to be shoved to the side, that it is not a sign of weakness – it is a disease. 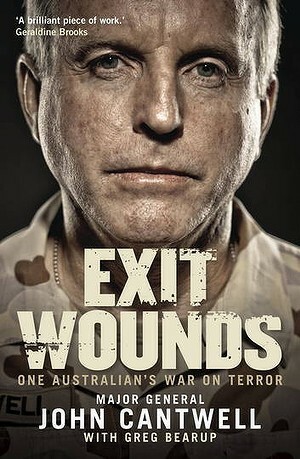 Exit Wounds is split into four sections – The first Gulf War, The Second Gulf War, the Middle East area of Operations (mainly Afghanistan) and a very small final section back home in Australia. John’s wife also write two chapters that add a different angle, often pointing out things that Cantwell is too proud (often not wanting to blow his own horn) to admit. She also discusses the things that she thinks are important. The first section of the novel – the First Gulf War – is action packed, on the front lines account of combat while attached to the British Military. It gets the adrenaline pumping and allows an insight into Cantwell as an officer, but also his humanity and humour. There is also the introduction to the beginning of his battle with mental illness. The second section of the novel – in Iraq – is interesting in its comparisons with the first, this time he has a more senior role and makes decisions that influence larger groups of troops. He works hard, so unbelievably hard! This part of the novel introduces the John that we come to know by the end of the novel, one battling against the odds. The Middle East Area of Operations follows Cantwell in a role with even more responsibility, and the guilt and situations he finds to put upon himself makes me cry. The deaths of the Australian Diggers is overwhelming, and the recounts are described in a factual, but emotionally hard hitting way. The final part of the book – especially the chapter named Exit Wounds – is where the book really comes into its own. Cantwell is forced to make some very difficult decisions, and as always, he puts the Army and the Diggers first. His battle with PTSD is virulent and it is heartbreaking to see someone who is a hero be wracked with guilt. I would certainly love to meet John Cantwell to shake his hand and thank him for his service, but this book has reminded me that there isn’t enough recognition of what our Servicemen and women go through for our country. Regardless of the reasons we went to war, regardless of political posturing, we need to be behind our troops, not only when they are in a combat zone, but also when they are home.